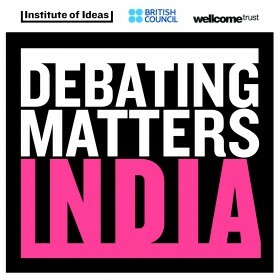 Debating Matters India is jointly organised by the British Council India and the Academy of Ideas. Now in its sixth year, the Regional Finals haven taken place in Delhi, Mumbai, Chennai and Kolkata. The competition was supported by the Wellcome Trust. This sixth year of the competition is also Debating Matters India’s last. For funding and organisational reasons there are currently no plans for a DM India competition in 2014. But DM India continues to inspire beyond the annual competition organised by the British Council Indial and the Academy of Ideas - in Chennai there is already a hugely successful competition, The Bait, which was initiated by alumni of Debating Matters, and now involves dozens of schools in several cities in addition to competition alumni now at university or starting professional life, who have been inspired to organise debates of their own. The Debating Matters India team would like to thank everyone who has been involved over the six years for their invaluable contribution to the competition. Read the full story here. Congratulations to the champions of Debating Matters India Year 6: PSBB Senior Secondary School, KK Nagar, Chennai! PSBB Senior Secondary School, KK Nagar, Chennai were crowned the champions of Debating Matters India Year 6 after a series of hard fought debates which took place at the Head Office of the British Council India in Delhi on 29th and 30th November 2013. Debates were had over intellectual property and India’s need for cheap generic drugs, as well as a debate on media regulation that drew parallels with the UK debate following the Leveson inquiry. Semi-final debates were had on fertility tourism, and the standing and importance of secularism in modern-day India. The event culminated in a nail-biting final between Convent of Jesus and Mary, Delhi and PSBB Sr. Sec School KK Nagar on whether India should abolish the death penalty. The judging panel for the final - Dr Shrishendu Mukherjee of the Wellcome Trust’s India Initiative; Dr Giti Chandra, Associate professor of English at St. Stephen’s College, Delhi; and the leading Indian economist Dr Amir Ullah Khan - eventually awarded the victory to PSBB from Chennai. Read the full story of this years DM India National Final! Visit the British Council’s Debating Matters India competition website.